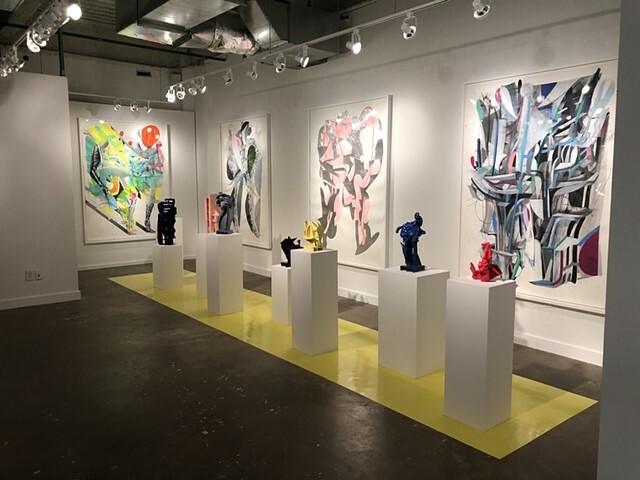 I am excited to have new paintings and a large ceramic sculpture featured in the Carrie Secrist Gallery booth, number F21, at the Dallas Art Fair along side gallery artists Anne Lindberg, Stephen Eichhorn, and Liliana Porter. The Fair runs April 11-14. I am honored to have a new essay on my recent work written by Berlin-based independent art critic Laurie Rojas, written on the occasion of my solo shows ABOVE GROUND POOL at Johannes Vogt Gallery in NYC and NEW SUCCULENCE at Carrie Secrist Gallery in Chicago. I am pleased to announce my solo exhibition NEW SUCCULENCE at Carrie Secrist Gallery in Chicago is open March 16th - April 27th, 2019. I am very excited to announce my upcoming solo show at Johannes Vogt Gallery in NYC, presented in cooperation with Carrie Secrist Gallery, Chicago. I will be presenting four new paintings and a new monumental ceramic sculpture in their project space, Next Door Gallery. The show runs March 2nd - March 30th, 2019, with an opening reception on the evening on March 2nd. I will have new large works on paper, ceramic sculptures and lithographs on display this weekend, April 13-15, at the Dallas Art Fair. You can find my work alongside works by Shannon Finley and Whitney Bedford at Carrie Secrist Gallery, booth F5. To see available works click here. Please join me for the opening reception of my solo show “Alter Ego” at Carrie Secrist Gallery on January 20th from 5-8pm. The show will feature new works on paper, paintings on canvas, ceramic sculptures as well as a series of lithographs I recently completed at Keystone Editions in Berlin. The show runs through March 3rd. Featured on James Yood's list of top shows in Art Ltd.
Really proud to be listed in such good company on James Yood's top Chicago shows of 2016 in Art Ltd.
Andrew Holmquist is one of the artists in Soho House’s permanent collection. He is joined by art historian David Getsy in the Music Room to celebrate his new body of work featured at Carrie Secrist Gallery. Enjoy a glass of Solo Contigo as they discuss his essay “Promiscuous Abstraction” and his book STAGE LEFT which features a 32-page queer super-hero comic that unifies his painting, ceramic, 16mm film and costume work into a coherent narrative. My third solo exhibition, titled STAGE LEFT, opens January 23 at Carrie Secrist. The show features painting, costume, 16mm film and ceramic as well as a catalogue containing an original 32-page comic book made for the exhibition. Stop by Carrie Secrist Gallery, booth #216 at EXPO Chicago this Thursday-Sunday 9/17-9/20 to see new paintings and works on paper of mine. Please join me this Saturday June 20 from 4-7pm at Andrew Rafacz Gallery for the opening reception of Baudrillard’s America, a group exhibition of new painting by Larissa Borteh, Jay Davis, Ted Gahl, Richard Galling, Noël Morical, Josh Reames, Adam Scott, Wendy White and yours truly. The Show runs through July 25. I’m excited to be featured alongside Carson Fisk-Vittori in the Carrie Secrist Gallery both at the UNTITLED fair in Miami Beach, open Dec 3-7. If you’re in the neighborhood please check it out! I'm honored to be a part of the upcoming “Ground Floor” exhibition at the Hyde Park Art Center, which gathers twenty recent MFA graduates from the Chicago area. Please join me for the opening reception December 12 from 5:45-8:00pm. Please join me this Friday October 3 from 6-10 for the opening reception of Fantasy Zone: K-9 Island at Hidden Dog Gallery. The show features new work from Karolina Gnatowski, Berlin-based illustrator Sharmila Banerjee, and yours truly. Hidden Dog is located at 2151 W 21st Street in Pilsen, and the show runs through october 24. New paintings at EXPO CHICAGO this weekend! I am excited to have paintings in both the Carrie Secrist Gallery booth (#222) and the Hyde Park Art Center Booth (#814) at this year's EXPO CHICAGO, the international exposition of contemporary and modern art held at Navy Pier September 18-21. At Carrie Secrist I will be debuting new paintings and will be joined by Whitney Bedford, Anne Lindberg, and Paul Anthony Smith. New paintings of mine will be cycled through the duration of the fair, so repeat viewing is advised! The HPAC booth is dedicated to showcasing the recent MFA graduates from the Chicago area who were selected to be included in the Ground Floor show taking place in December, which I am honored to be among! I'm an artist worth investing in! I'm featured in this Chicago Magazine article about "four rising chicago artists worth investing in"
From July 12 through August 9 you can swing by Carrie Secrist Gallery to see a summer project show featuring the new video and artist's books I have been working on in conjunction with painting during my two years in grad school at SAIC. In the front gallery i have created a reading room showcasing the new limited edition box set of books (which is featured in the "illustration" section of my site). Each set contains 10 books produced on the offset press. As a backdrop for this space I have selected a section from my most recent book "Connection" and blown it up to fill a 40ft wide wall! The second gallery has been turned into a screening room featuring the video from my MFA show "Painting, Time and Space" and the two videos that lead up to it. "Painting, Time and Space" can be found in the 2014 folder in the "Artwork" section of my site. It looks better big so check it out at the gallery if you can! Please check out this recent interview I did with Kevin Blake for Bad at Sports! In May 2014 I received my MFA degree from the painting department at The School of the Art Institute of Chicago! Not only that, I also am the proud recipient of the Carrie Ellen Tuttle Painting Fellowship! Click here for a review of my show Marco [Polo] written by Matt Morris for Newcity. He talks about my work in relation to two other concurrent shows to address the use of the body and its deconstruction in Chicago art. Very honored and pleased to read this thoughtful response. I'll have several new paintings on display at the Carrie Secrist Gallery booth at EXPO Chicago, the second annual international exposition of contemporary and modern art held at Navy Pier. The show runs Friday through Monday 9/20-9/22. I am thrilled to announce my second solo show at Carrie Secrist Gallery, Marco (Polo), will be opening this Friday September 20th! 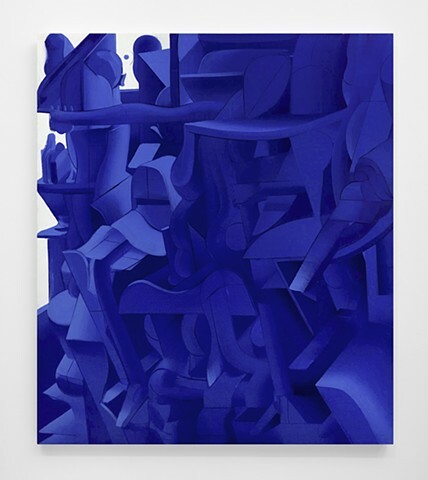 The show features new paintings, sculptures and prints that explore textures of the summer, depictions of space, and an ongoing investigation of abstraction from the figure, landscape and still life. Please join me for the opening reception from 5-8pm this Friday 9/20 at Carrie Secrist Gallery, 835 W Washington. The show is on view through October 12th. I'm pleased to announce I am one of the featured artists in the 20th anniversary exhibition of Carrie Secrist Gallery. Please join me for the opening reception this Saturday, December 15th from 5-8. Carrie Secrist Gallery is located at 835 W Washington in Chicago. My work is also currently on display in two shows outside of Chicago: Small Packages at Cumberland Gallery in Nashville and The Magic Flute at Golden in New York. If you find yourself in these parts in the coming weeks please check them out! Check out my paintings at the Carrie Secrist Gallery booth at PULSE Miami! I am honored to be a featured artist in “The Magic Flute” opening at Golden Gallery in NYC this Friday, November 16. 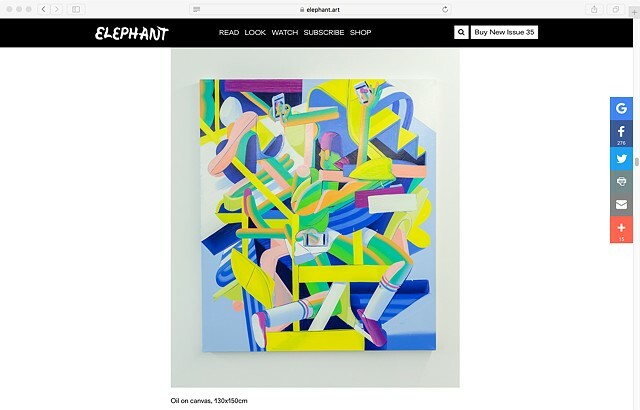 This exhibition is structured around the paintings of Kimber Smith, one of which shares the name of the show, and also features work by Elijah Burgher, Joe Fyfe, William J. O’Brien, Tal R and Patricia Treib. Open Studio Night at SAIC and MDW Fair! This coming Friday, November 9th, I will be participating in Open Studio Night at The School of the Art Institute of Chicago. Graduate studios across campus will be open to the public and many of the artists will be present to talk about their work. The event goes from 4:30-10:00pm, with my building and studio (Maclean building, 112 S Michigan Ave, studio 1711) open from 5:30-7:30. Also taking place this weekend, I will have work included in the show miniature/GIGANTIC in the Slow Gallery booth at the MDW Fair. I will be contributing a new 8-foot tall painting along with 3 months of daily paintings to the “gigantic” part of this two-part exhibition. The MDW Fair takes place November 9-11th, 2012 at the Mana Contemporary Chicago located at: 2233 South Throop Street Chicago, IL 60608. I've created a blog where I will be adding paintings on a regular basis from my new daily painting series, along with source images that i find inspiring. You can check it out |here! Hello! I am pleased to announce that I will be in a three person show titled "Temporal Figuration" at LVL3 opening this Saturday, April 14th from 6:00pm-10:00pm. The other two artists are Jade Walker, a sculptor based in Austin, and David Brandon Geeting, a photographer based in Brooklyn. LVL3 is located at 1542 N Milwaukee ave, I hope to see you there Saturday night! I was recently featured on the Painttube blog. Nice! Check it out! My show at CSG included in Newcity's top 5 painting shows of 2011! 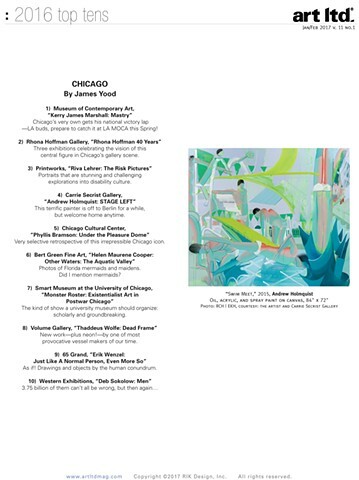 I am very proud to be included on Newcity's list of the top 5 painting shows in Chicago of 2011. This is for my solo show at Carrie Secrist Gallery this past September. There will be a closing reception for my show WORLDS COLLIDE at Carrie Secrist Gallery this Saturday, 10/15/11, from 3:00-5:00pm. I will be present and happy to talk about the paintings in the show to anyone who cares to listen. Hope to see you there! Carrie Secrist has married and altered her gallery's agenda to greater emphasize young and emerging artists and she starts of the season with a bang. Andrew Holmquist is a recent graduate of the School of the Art Institute. Some of his paintings are glorious, a few are clunkers. some are humorous and all are brave. Holmquist has joyous talent and trusts his aesthetic impulses, which over time will surely get honed, but for now he's sharing his not very bridled gusto with us. I love the vulnerability. To see the entire list check out the following link. 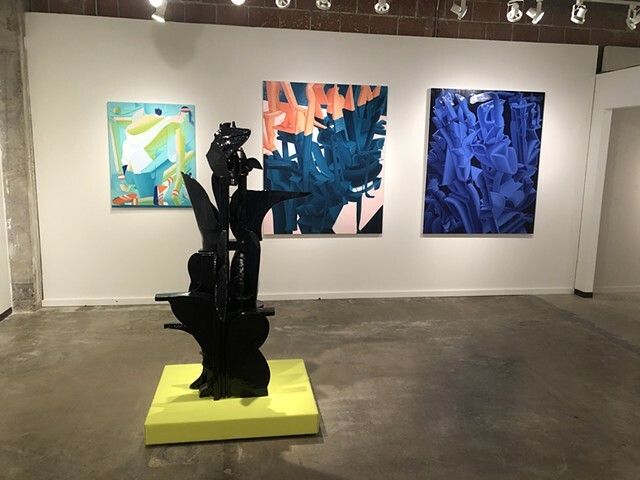 A one-person exhibition of my paintings, entitled "WORLDS COLLIDE" is currently on display at Carrie Secrist Gallery in the West Loop neighborhood of Chicago. The show features six large new paintings, a few new medium-sized paintings and two series of new daily paintings. One series spans 7/29/11, the day I was offered the exhibition, to 9/8/11, the day before the show opened. The second series began on the opening day, 9/9/11, and will continue throughout the length of the show till its closing on 10/15/11. New paintings are being added daily, so even if you've already seen the show there's good reason to go back to see the progress i've made. Check out the Carrie Secrist Gallery website to read the press release and for more information. I'm going to have new paintings up at both the MDW Fair and the Art Chicago Next Fair as a featured artist in the booths run by Slow Gallery. The MDW (midway) Fair is this Saturday and Sunday, 4/23 & 4/24, at the Geolofts, 3636 S Iron Street, Chicago, and is a gathering of Chicago-based galleries, spaces, artist groups and initiatives that will fill over 25,000 square feet of exhibition space. The Next Fair at |http://www.artchicago.com/|Art Chicago is the following weekend, 4/29-5/2, and is held at the Merchandise Mart in downtown Chicago. Please come by if you're in the area and check out what's going on! I am pleased to be a part of the three person show "3.2..1...GO!" currently on view at Tugboat Gallery in Lincoln Nebraska. The show is curated by Byron Anway and also features the work of David Brian Dobbs and Ben Moore and will be on display through April 30th. Visit the Tugboat Gallery website for more information. I have a piece up in the silent auction at LVL3 Gallery tonight, with all the money from the event benefiting art education. Prices for all of the art in the show start at $20 so come buy some affordable art for a good cause! Check out the Galleries & Museums section of this week's Chicago Reader and you will see a photo of one of my paintings and a write up of my show at The Center on Halsted! Full color! Please Join me this Friday, February 18th, between 7:00pm and 9:30pm for a showing of my paintings at the Center on Halsted, located at 3656 N Halsted (close to the Addison red line stop). I will have a number of paintings and works on paper on display on the second floor, much of which are brand new, though there are some hold-overs from previous shows of the past year. The work will be on display through March 22 so if you find yourself in the neighborhood take a look. I’m pleased to announce I will be participating in the first Art Loop Open exhibition, taking place from October 15-29 in downtown Chicago. This is both an exhibition and a competition between nearly 200 Chicago-based artists that will have their work on display at 10 locations throughout the loop where the public will be able to vote for their favorite artworks. The artists that receive the most votes will move on to the final round where cash prizes are eventually awarded to the top three. To vote you will need to text the corresponding ID number found on the info card next to each piece. In the first round of voting, 10/15 – 10/21, you can vote for as many pieces as you like. From what I have seen there are a number of really interesting pieces so please come check it out (and if you vote for me that would be great!). This Friday, October 15th from 5-8 there will be an opening reception art crawl going to each location so please come by for a complementary “artini” and a chance to talk to the artists. I am proud to be showing with Mike Andrews and Easton Miller at Jolie Laide Gallery in Philadelphia. The opening is Friday, October 1st from 6-9pm. If you are in the area please come by and say hello! The good folks at LVL3 interviewed me for their blog. Check it out!